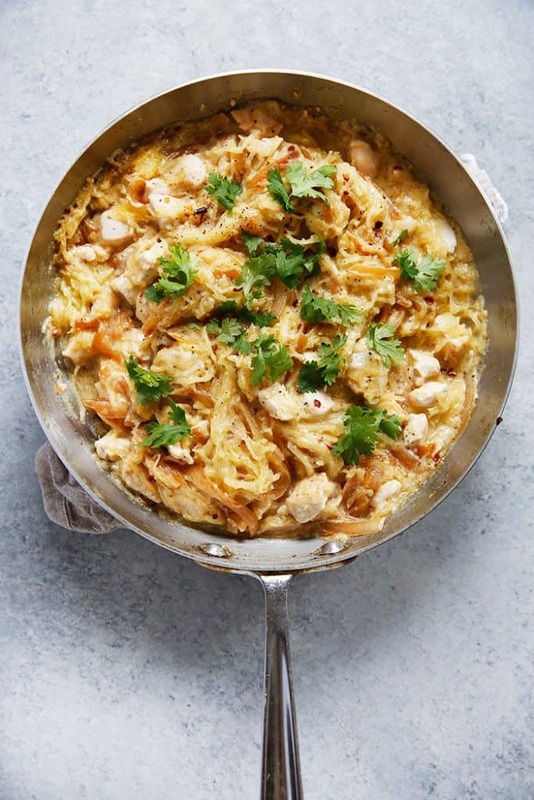 This recipe is one of my most popular paleo recipes for good reason! 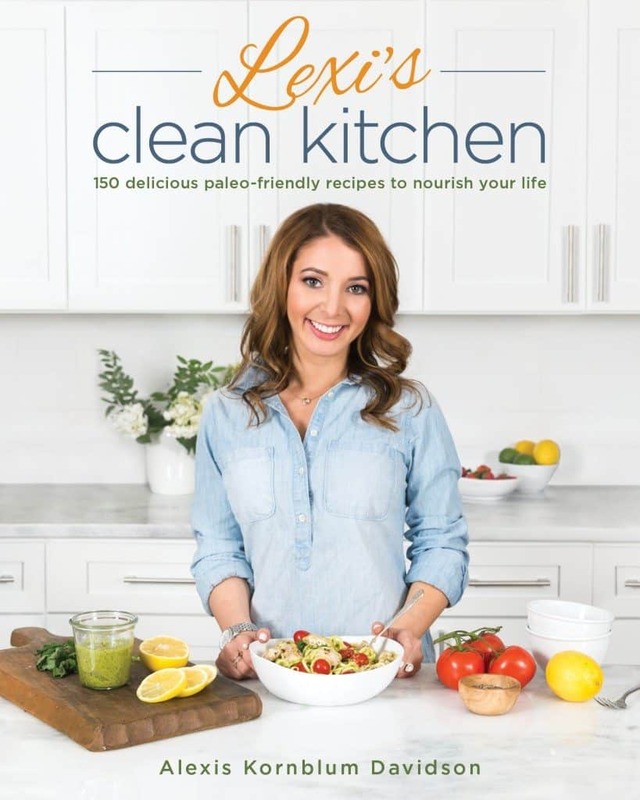 It is the BEST paleo bread recipe. 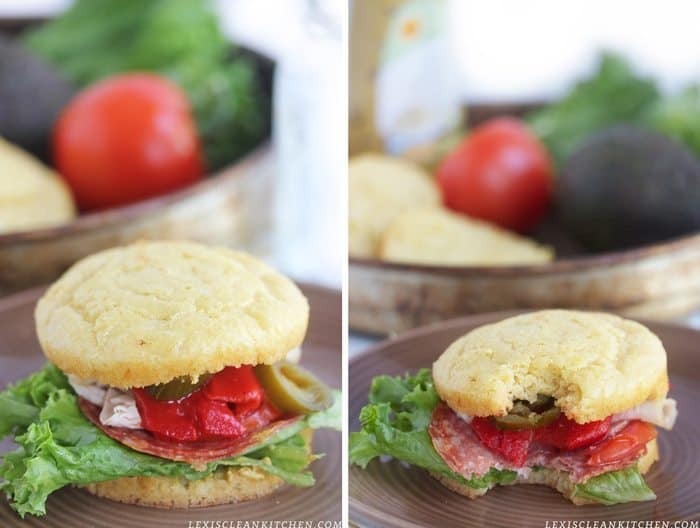 These ultimate paleo sandwich rolls are ones that everyone will love. 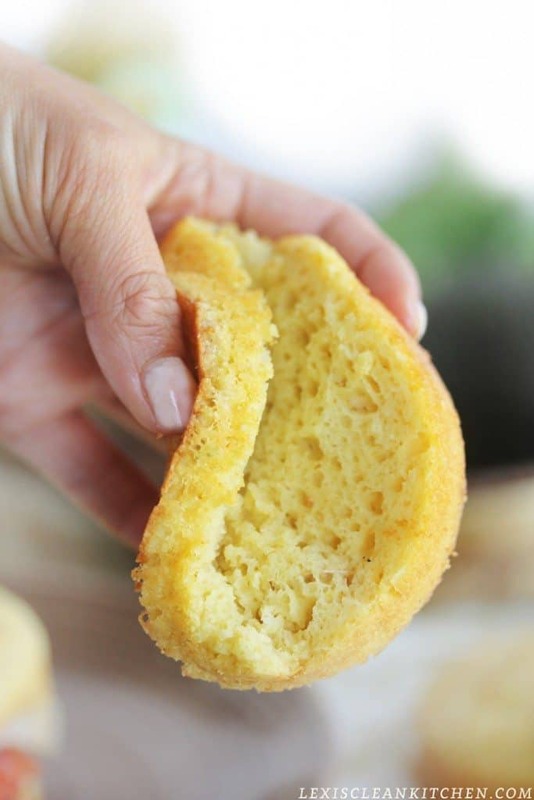 They are gluten-free, grain-free, fluffy, sliceable, and TOTALLY BREAD-LIKE with the best texture! Plus, they are simple to prepare! P.S. Want a nut-free version? Click HERE. My ‘Everything Bagel’ Cauliflower Rolls are a huge hit around the web. But let’s be real, just like cauliflower pizza crusts, they are still cauliflower. They can’t really taste like pizza (or bread). 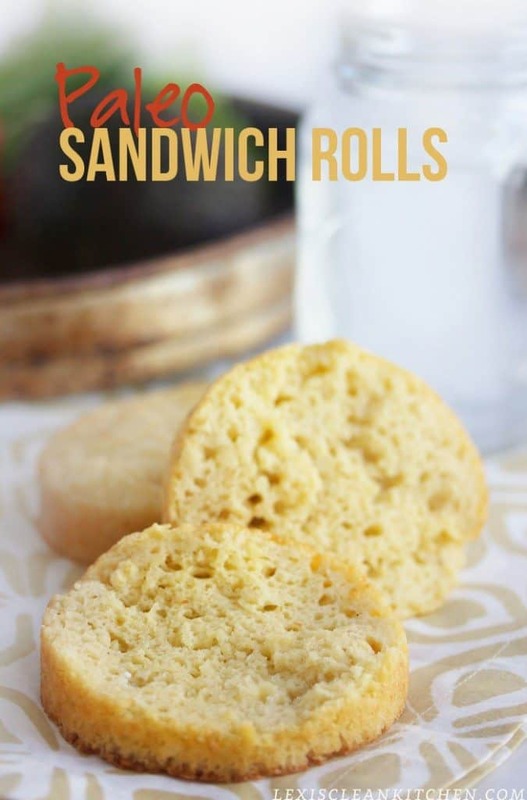 So I bring you: The Ultimate Paleo Sandwich Rolls. Trust me. Can you see that texture? Easy, breezy sandwich rolls. Trust me! 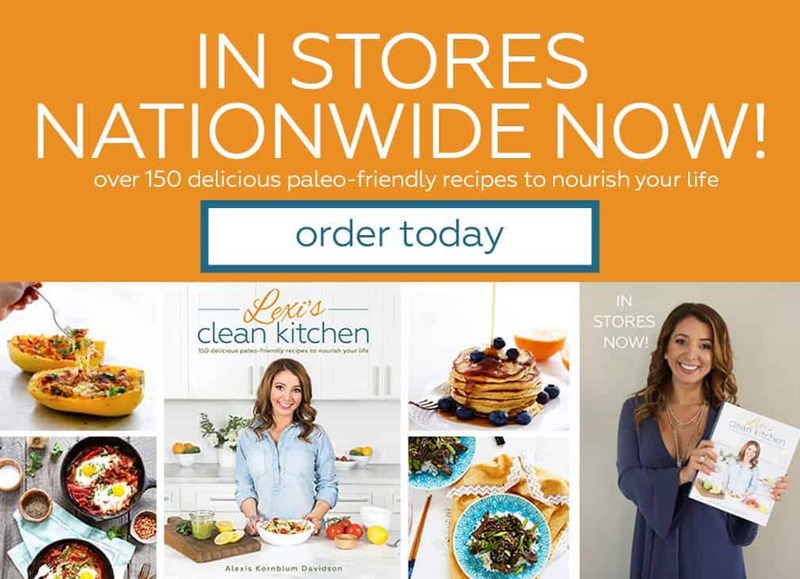 What kind of bread can you eat on the Paleo diet? Making this homemade bread is easy and kid-friendly! 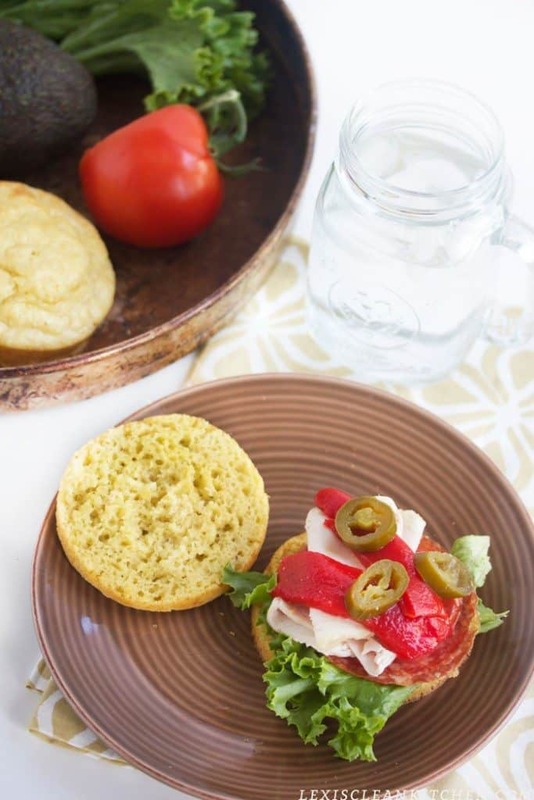 Paleo bread is different from gluten free bread because often on the paleo diet most grains are avoided. So gluten-free breads made with gluten-free flours like rice flour, teff flour, and corn meal would not be considered paleo bread! I like using this combination of almond flour and tapioca flour as it creates the most legit paleo bread, and gluten-free I’ve ever tried! In a bowl combine almond flour, tapioca, baking powder, and dash of sea salt. Add in eggs and apple sauce and mix to combine. 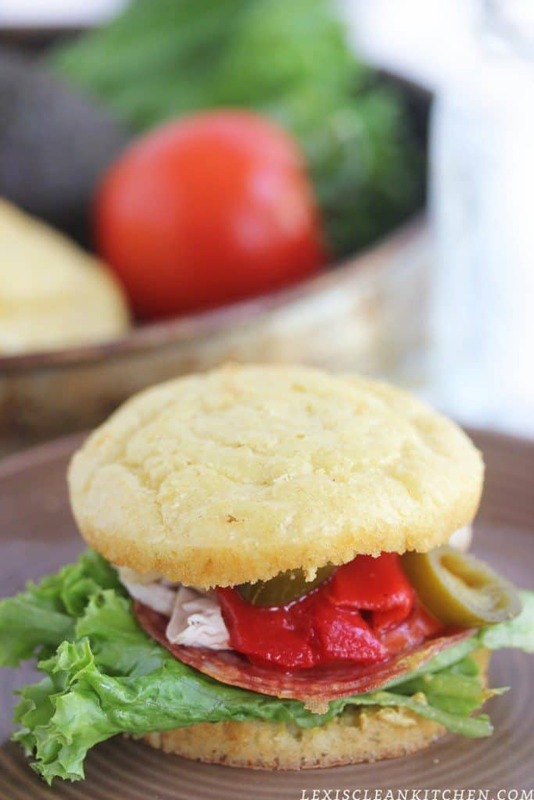 Place round molds or large mason jar lids on a baking sheet and grease well. Pour batter into molds until almost at the top, a little less. Let cool slightly, slice in half, and serve. I use round molds or mason jar lids, and it yields 4 fluffy sandwich rolls. See the comments for how readers have adapted! Updated 2/2017. I used to add 1 tablespoon of coconut oil or palm shortening but don't find it necessary for the texture so it has been removed. Are you ready for Fall? 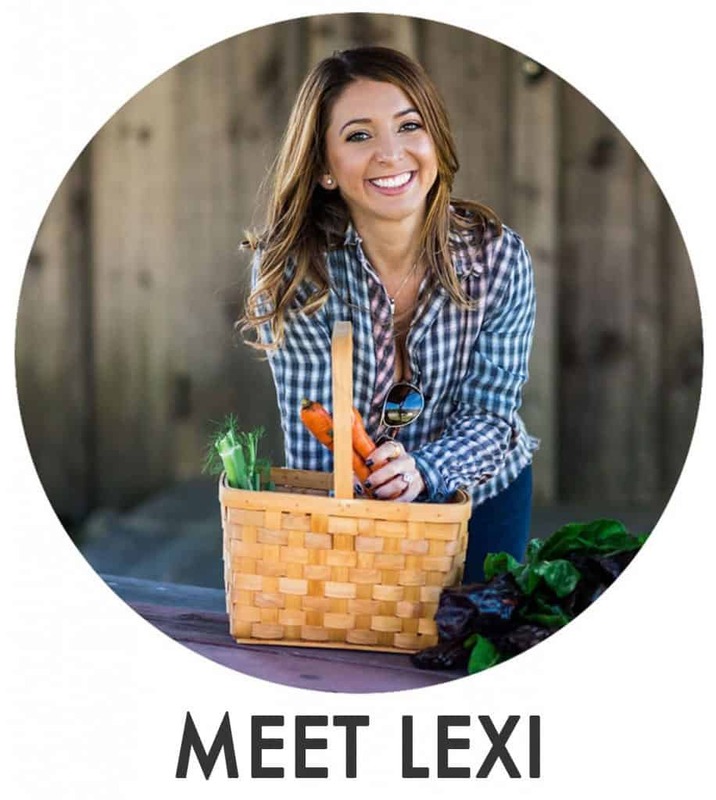 Fall recipes, cooler weather, apple picking, all things pumpkin, leggings, boots, scarves? Ready or not, it’s a-comin’! 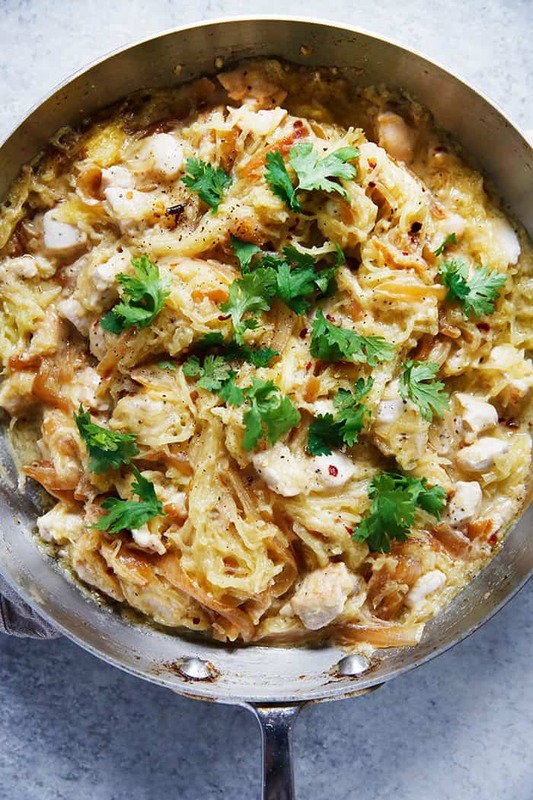 This Spaghetti Squash Alfredo with Chicken and Caramelized Onions is hearty comfort food meets healthy and nutritious! A perfect meal all autumn long! Let me tell you, this Alfredo isn’t your ordinary Alfredo sauce. It’s creamy and delicious, but not JUNKY! Wait what? Yes! Plus caramelized onions and chicken. You guys, run to make this one! 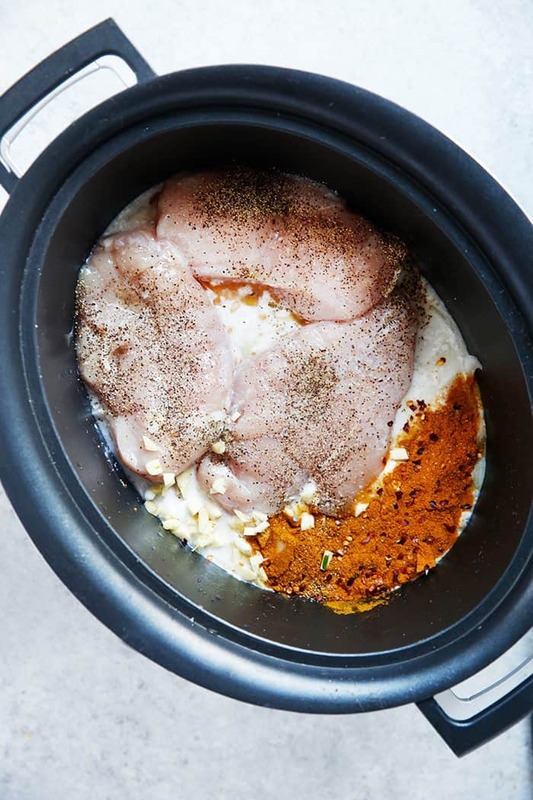 The combination of the good quality mayo + Pacific Foods Original Almond Milk (my favorite milk substitute for baking or cooking) + garlic and spices gives you ALL THAT FABULOUS FLAVOR. Creamy, healthy, goodness. How are you celebrating Fall? 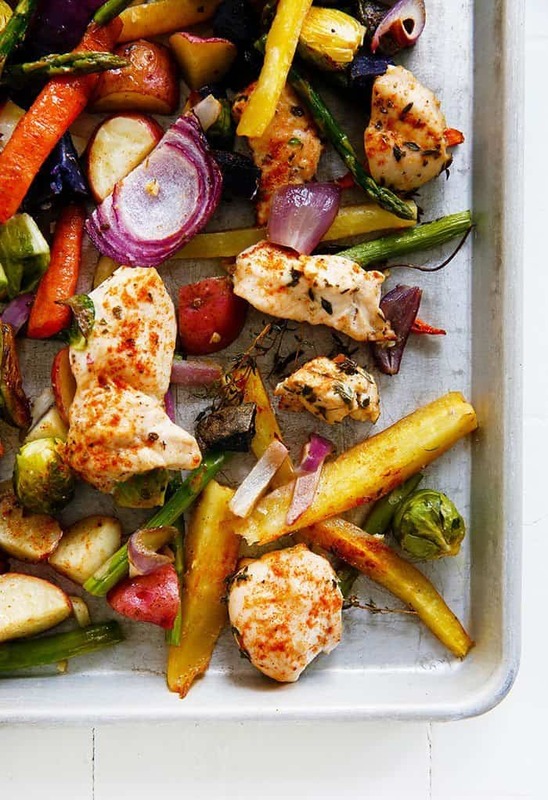 This Sheet Pan Chicken and Veggie Dinner is easy, flavorful, and delicious. What beats that? 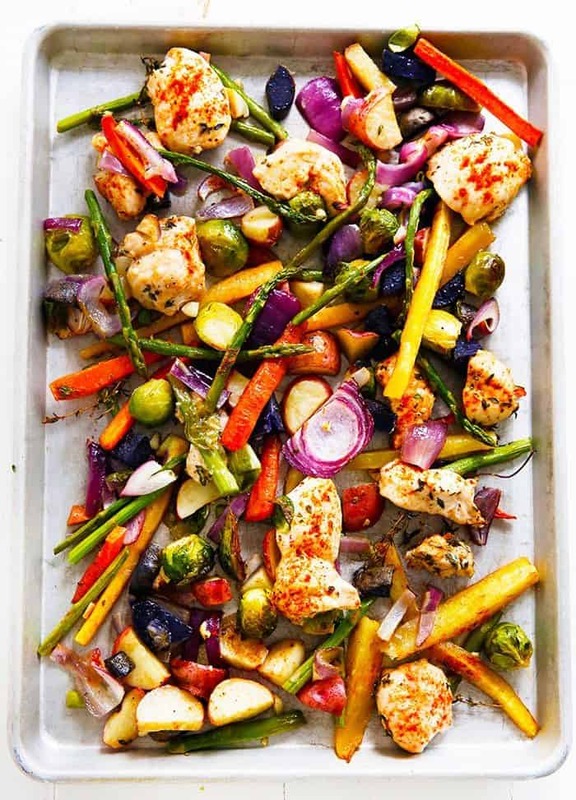 I am LOVING one-pan, sheet-pan or any meal that is essentially mess-free! 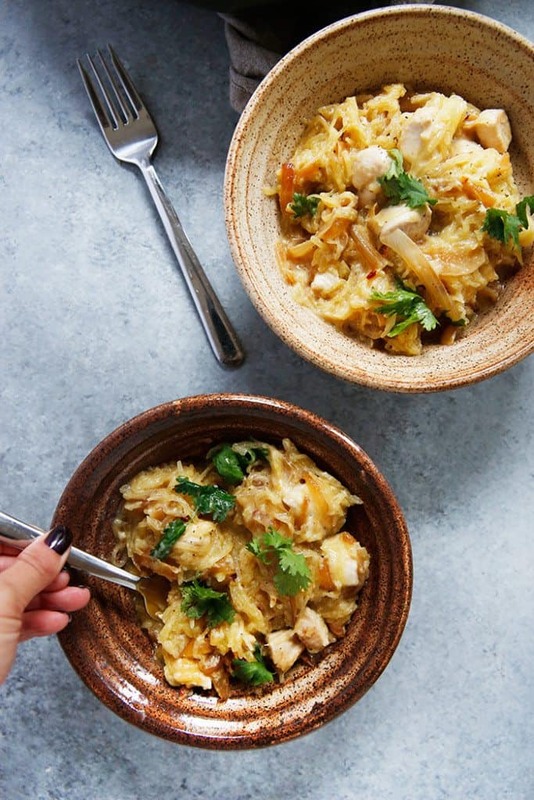 Toss the ingredients in a bowl, line on a baking sheet, bake, and devour! What you’re left with is an easy meal that requires minimal cleanup. 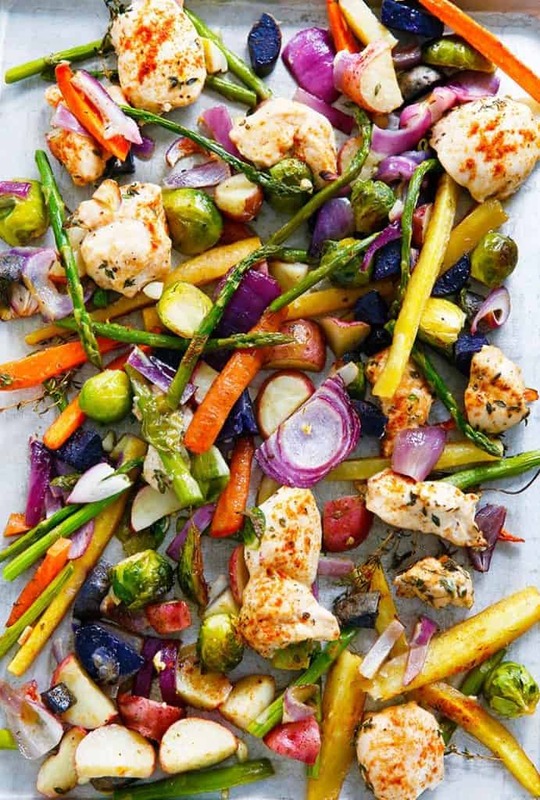 Plus, it’s totally customizable to the veggies you have on hand! Adjust oil based on how much veggies you have. 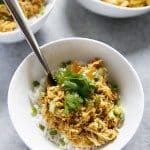 You want the veggie chicken mixture well coated. 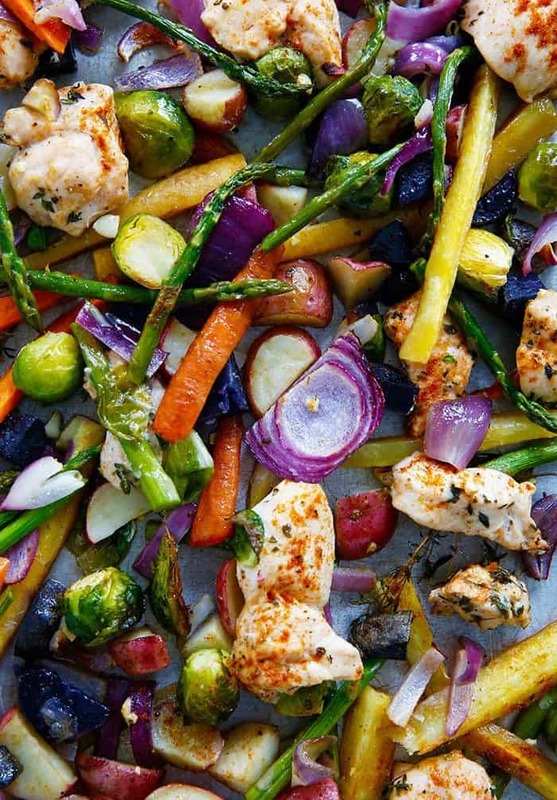 Use any other veggies you have on hand! 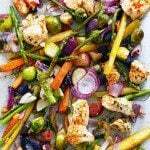 The chicken might be done before the vegetables, if this is the case, remove the chicken with tongs and bake until vegetables are tender. This Sriracha Lime Chicken Chopped Salad is bursting with flavor. 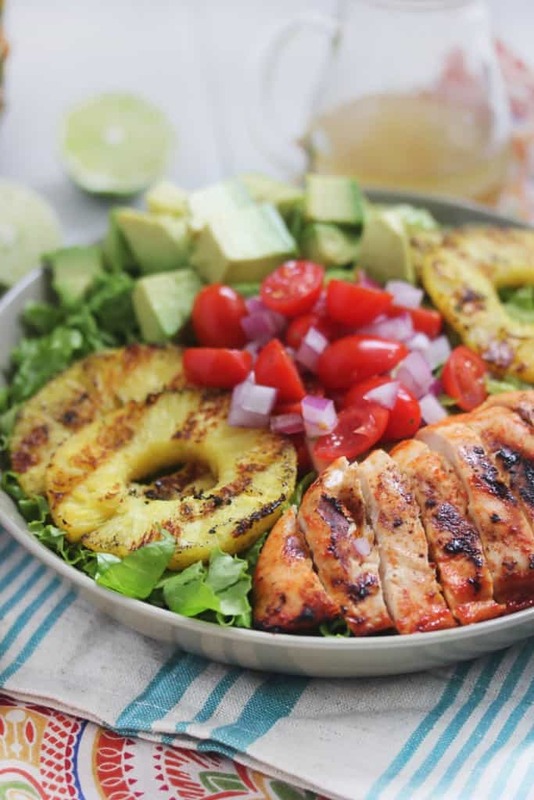 Bold, zesty chicken and juicy sweet pineapple make this chopped salad one of our absolute favorites! It is so hot here in Boston, and that’s coming from the girl who was just visiting Florida in June. Wheeeew, hot. In leu, turning on the stove the past two nights wasn’t quite in the cards. The grill was though, paired with this Sriracha Lime Chicken Chopped Salad that is just bursting with flavor. 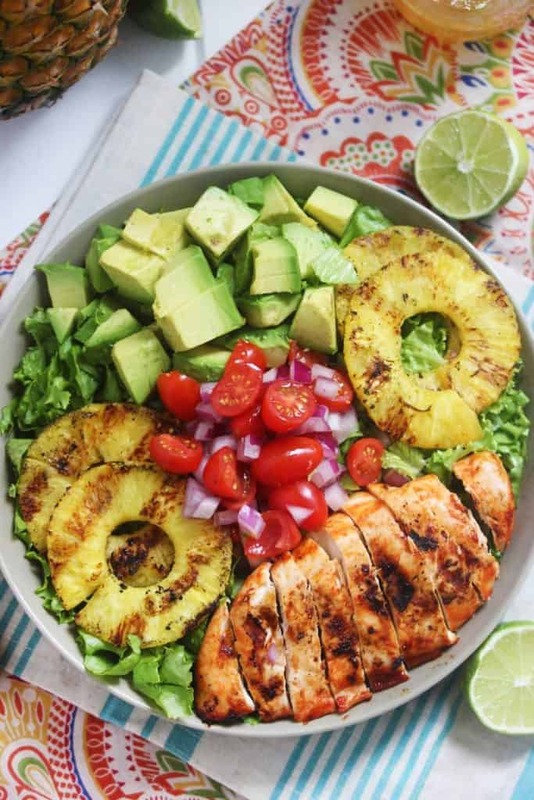 Let’s see what we got: spicy and bold chicken, sweet and juicy grilled pineapple, refreshing crisp local lettuce, local tomatoes, and finally, avocado. Count me in any day of the week. Oh, and don’t forget the light and easy lime vinaigrette. 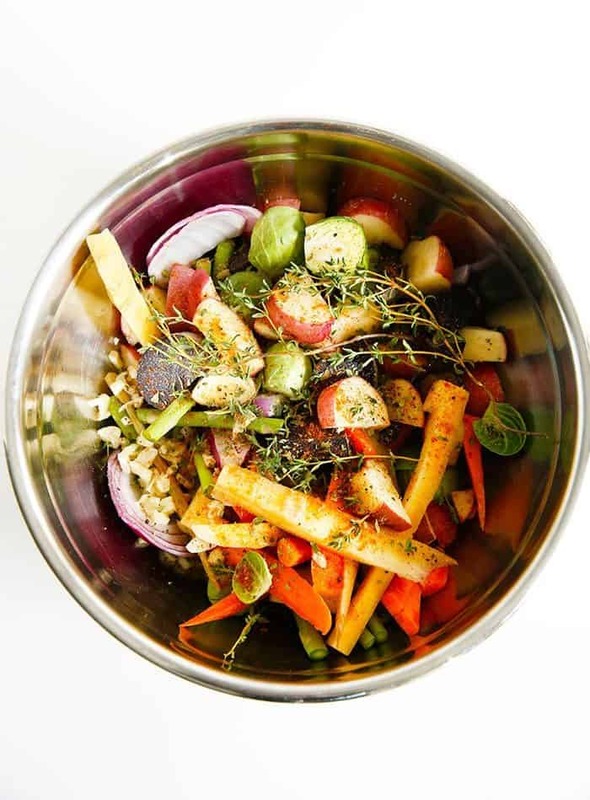 This salad is one of the most popular recipes on the blog, and for good reason! 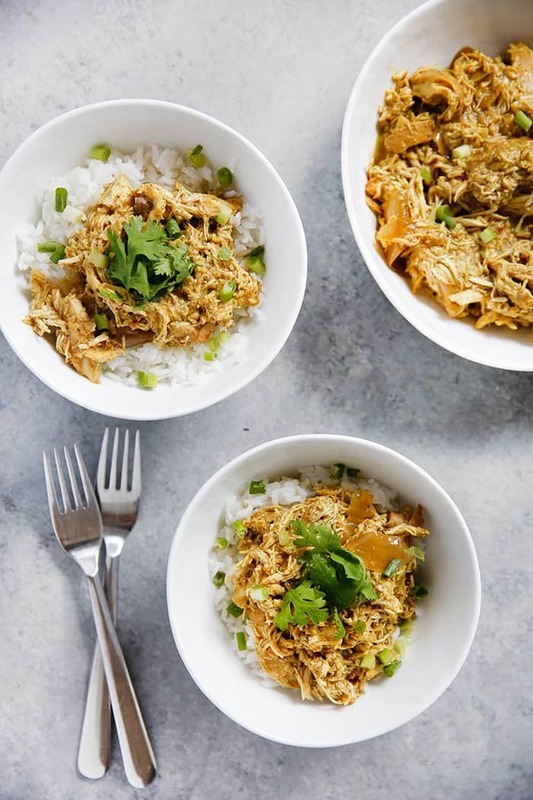 It’s simple, flavorful, with a deliciously bold chicken! 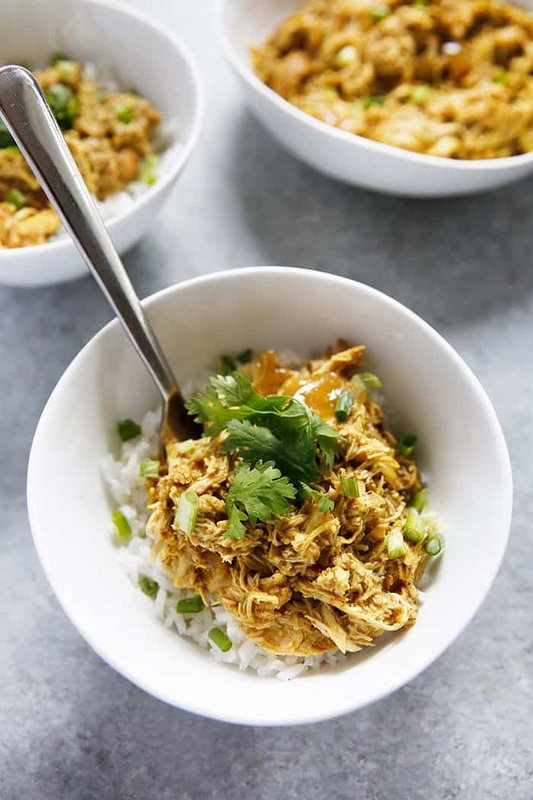 A little spice, a little sweet, a perfect dinner! The Sriracha and lime together make for a fabulous marinade that comes together quickly! 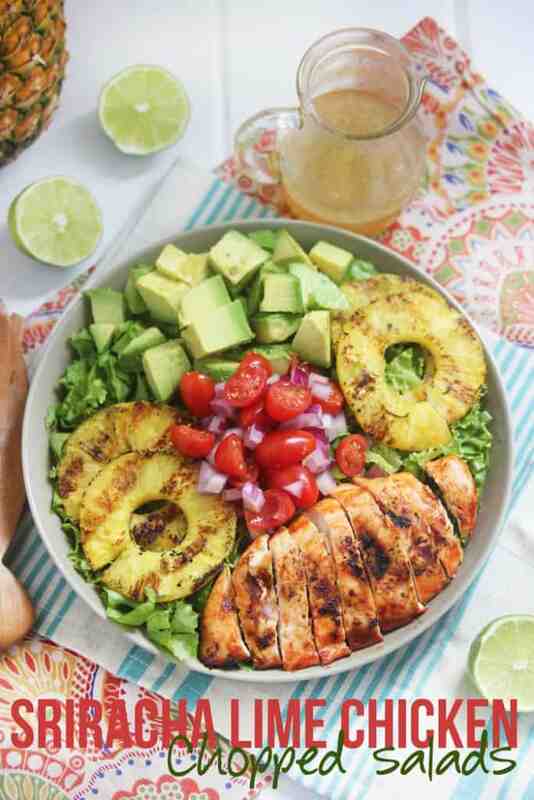 Healthy, low-carb, and perfect for summer! Season chicken with salt and pepper. 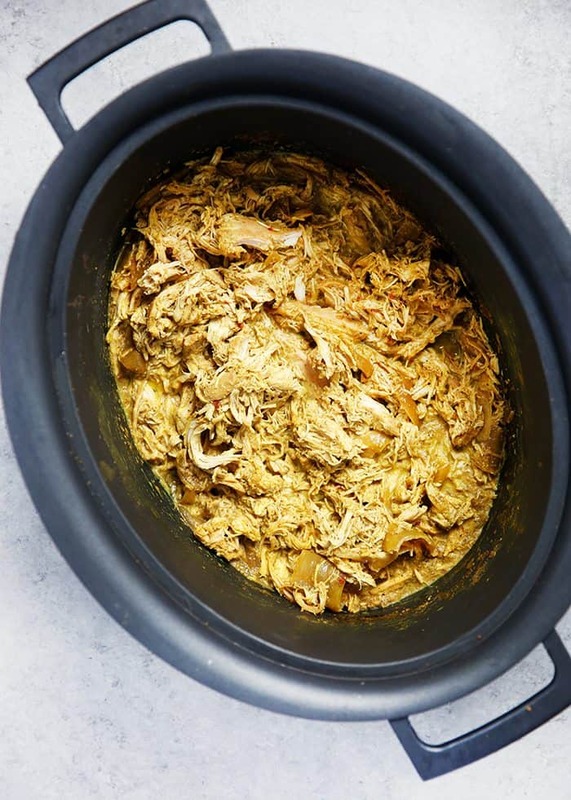 In a bowl or marinade dish, combine sirarcha and lime. 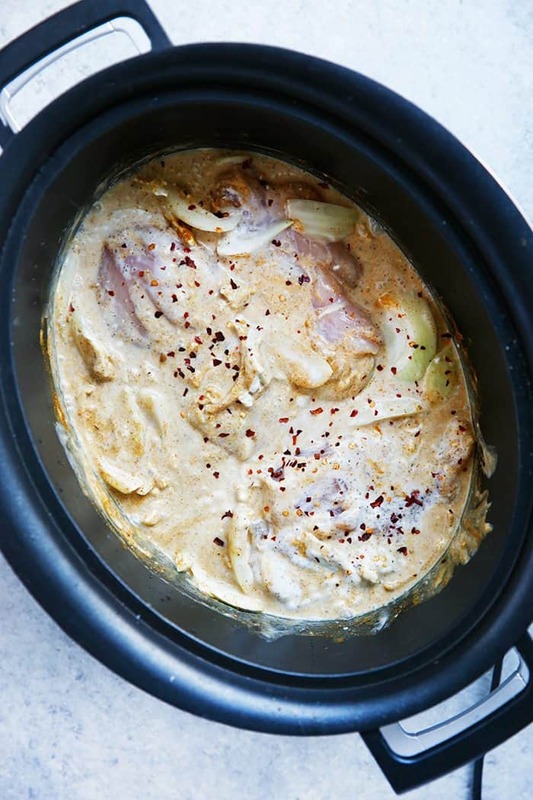 Add chicken and let marinade in the fridge for at least 20 minutes, the longer the better. Once ready to cook, add chicken to the greased grill. Cut pineapple using pineapple corer and add to grill, grill for 3-4 minutes on each side. While they are grilling, chop lettuce, then chop avocado, tomato, and red onion and add to serving dish. Whisk together dressing, taste, and adjust seasoning as desired (i.e. more lime, additional sea salt, additional vinegar)- place in fridge until ready to use. 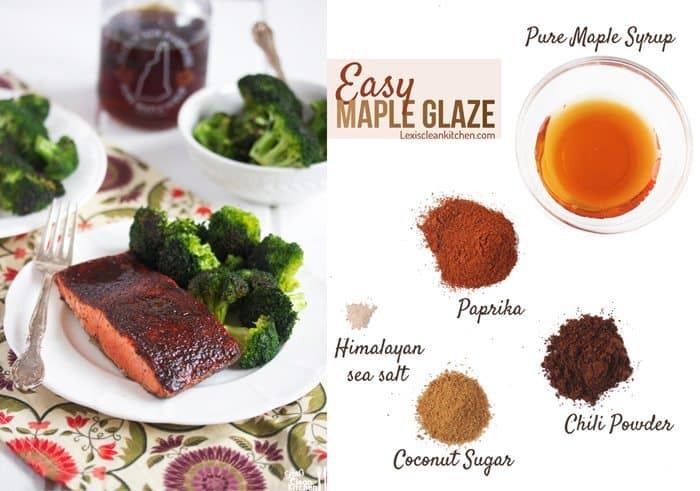 I am so excited to share this Maple Glazed Salmon recipe. 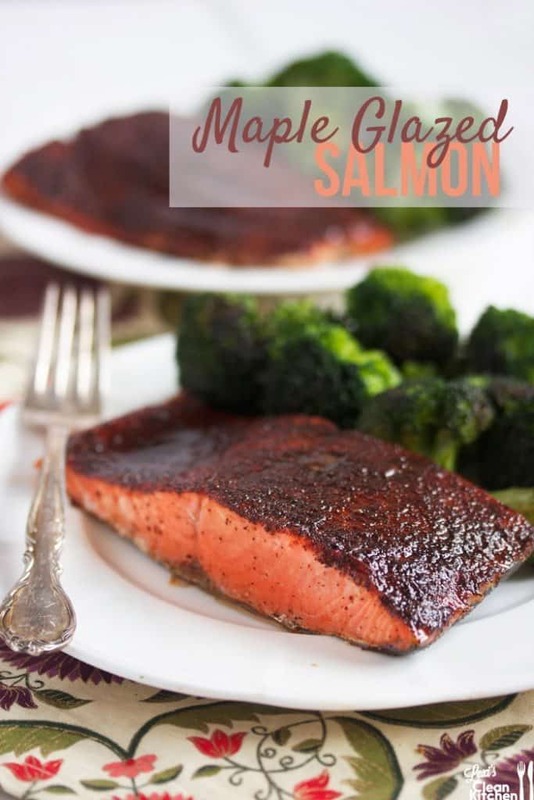 It is hands down one of my new favorite ways to prepare salmon. I love the layer of goodness it coats on the top of the fish, and the flavor it brings. A few months back we ate dinner at Mike’s parent’s house. His mom made a delicious salmon dish, and she mentioned it using brown sugar and maple syrup, and having a rub on it. Brilliant. I instantly knew it needed some adaptation! This salmon recipe is easy to make and is sure to be a crowd-pleaser. What is your favorite sweet and savory combination? Place oven on broil high. In a bowl mix together dry rub: chili powder, paprika, coconut sugar, and salt. 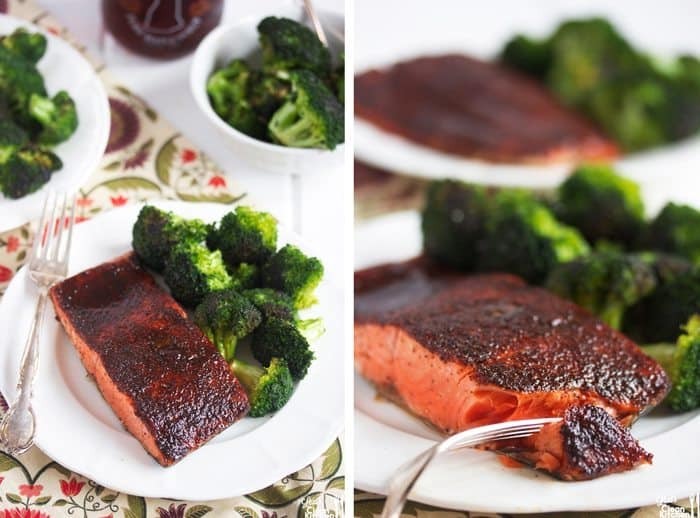 Cover salmon filets with dry rub. Place salmon on lined baking sheet and broil for 7-8 minutes. 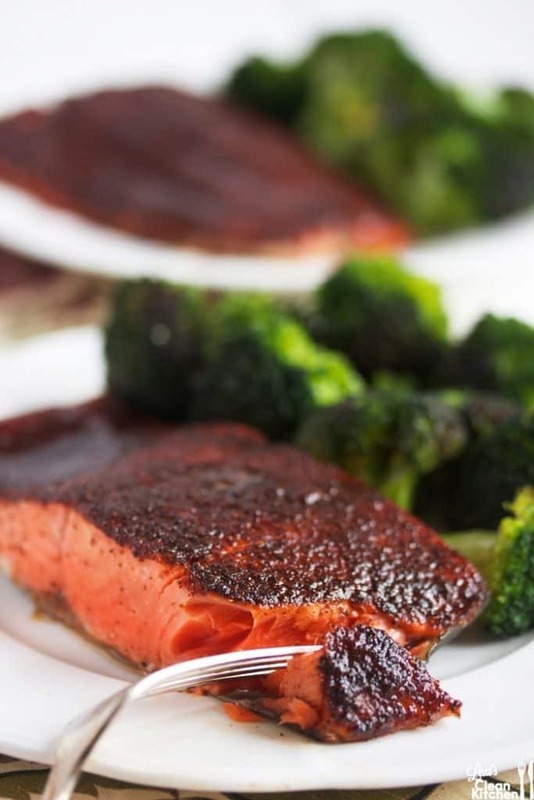 Brush maple syrup over salmon and broil for an additional 1-2 minutes. Enjoy!